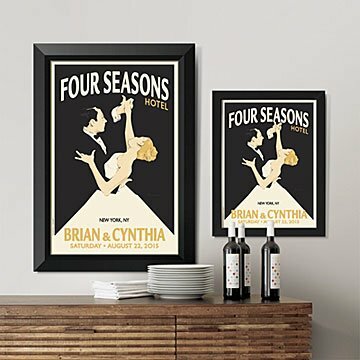 Sweep the couple off their feet with this personalized print that commemorates their first dance together. Sweep the couple off their feet with this enchanting print that commemorates their first dance as man and wife. Chicago-based artist Alexander Doll set scenes of wedded bliss in the context of a classic print announcement that is as stunningly unique as it is timeless. This nostalgic print hearkens back to the nuptial announcements of yesteryear with its sharp, sanserif typography, and hand-sketched illustrations featuring the bride and groom suspended elegantly in mid-dip. Alexander incorporates personal details, such as the venue, city, date, and the couple's names, and even the color of their tresses, to give each print a warm, personal touch. A sophisticated way to fete an unforgettable occasion, this inspired gift captures the couple's version of their fairytale while giving them a stylish and whimsical work of art to remember the thrill of the day with every passing glance. Printed on archival paper using archival pigment ink in Ohio. I love this artwork so much and it is a perfect and unique grift for our daughter and future son-in-law! I'll definitely order this again for other couples that are getting married!! Such a unique and special gift! Was a great gift for a couple who already have an established home together so really did not have items they "need." Their registry had been mostly tapped anyway. Very easy process to order this unique piece of art..great communication. Great 1st Year Anniversary gift! The gift has a prominent space in our home now, as my wife loved everything about it. Loved that it is a Personal touch to their Special day! Loved how customizable this was. Added in the details of my parents' wedding venue, their names, date of their wedding . . . it looks amazing and personal. The piece is truly amazing and personal, but as a single working girl, I have never spent this much on a wedding gift. I only did because it was so perfect. What do you get someone who has everything? I was looking for a unique perfect gift for my brother who was marrying a Colombian girl and the wedding was in Cartegena. When I saw this I thought wow this is perfect. I was able to design it to look similar to her and him and it came out perfect. They both said this was the best gift they ever received ! The most special gift. They can't stop looking at it. A perfect memory for a perfect wedding that took place in Cartegena Colombia. My brother said he will never forget his anniversary either! Everyone who sees it in their house is in awe of it. Just perfect.